www.photomacrography.net :: View topic - Large wood boring beetle with very short wing covers, ID? Large wood boring beetle with very short wing covers, ID? Posted: Fri Aug 13, 2010 10:13 pm Post subject: Large wood boring beetle with very short wing covers, ID? It seems like this critter should be easy to identify, but I've come up dry searching in Cerambycidae (the long-horned wood borers). 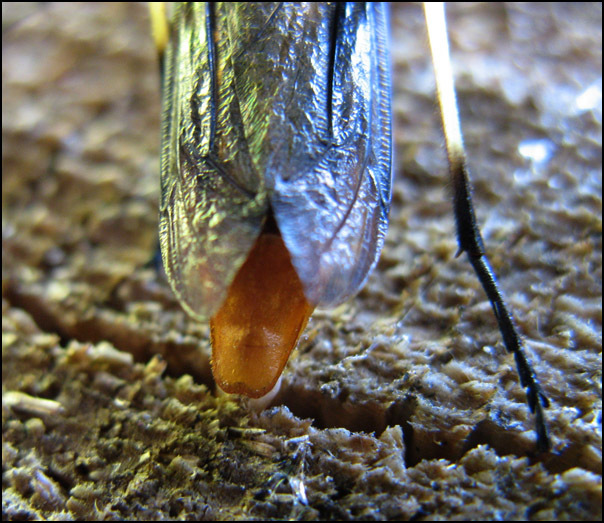 It's an egg-laying female, body length 3 cm, elytra extremely short. Location is south-eastern Washington, conifer forest around 2800 ft elevation. 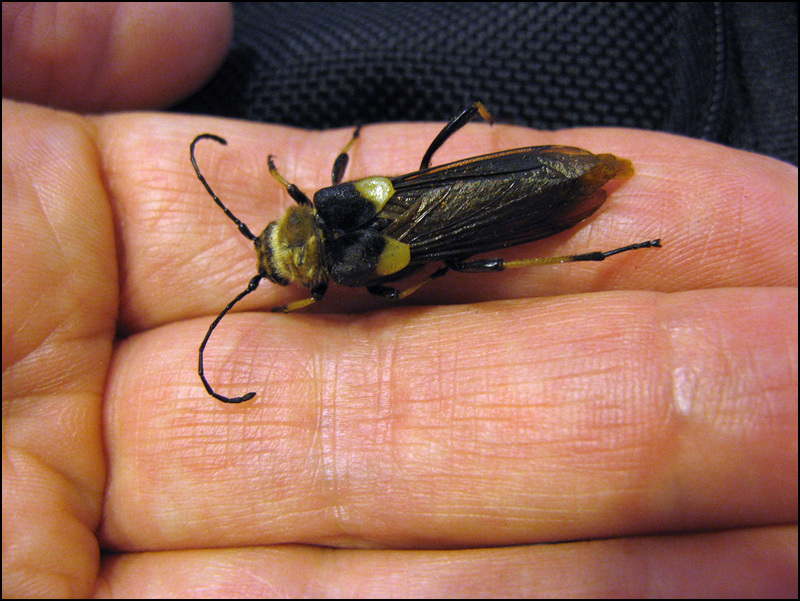 Perhaps one of our entomologists recognizes this beast? Interesting find Rik - can't help with ID though. Perhaps somebody else? Is there a good place to ask, other than BugGuide? I'll go out on a limb here; I doubt that it is even a beetle. If it is, it's somewhat aberrant. A beetle characteristic is having the fore wings hardened into elytra and meeting in the mid line; wing veins rarely, if ever, are visible. Your beast seems to have membranous Fws that overlap and with obvious venation. So what is it? I don't know, perhaps Hymenoptera (that's really sticking my neck out). Well, after I took these photos I also collected the specimen. It looked like such an odd beast, I figured there would be some questions later. And since it spent some time live in a collecting jar, I got to watch it there too. 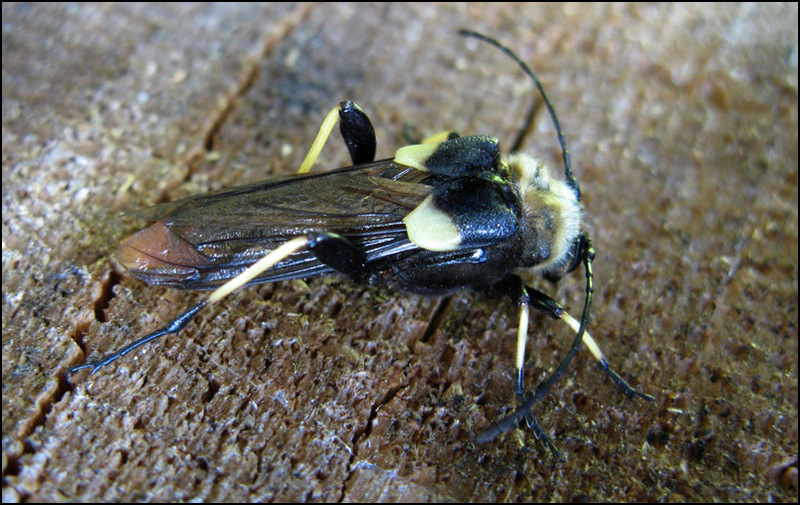 When it flies, those short yellow-tipped black horny structures hinge out to the sides, allowing the single pair of veined membranous wings seen in the photos to assume a normal flight position straight out to the sides. So I'm definitely thinking that we're looking at elytra and non-folded hing wings. The whole beast looks ever so much like normal Cerambycidae, except for the shortened elytra. If this is Hymenoptera, it's not even close to any body type I'm familiar with. However, Molorchus is a small beetle, something like 1/4 the size of this beast, and the general appearance is much different. What has me bugged is that I figured it would be easy to nail this beast because of the odd appearance, and obviously it's not ringing any bells. I do still have the specimen, however. It very well could be a LION BEETLE? Ulochaetes leoninus? 8th beetle down - I believe. Admin edit: RJL, April 16, 2014, to fix spelling of scientific name. Bingo! How the heck did you find that one?? BTW I love the shot of the egg laying - capturing the moment - great! Never underestimate the value of luck! I notice that the posting you found is datelined "Eastern Oregon, August 16, 2010". So it wasn't even there on Aug 13, when I posted my question! I see that BugGuide has one (and only one) picture of this species. No doubt I glanced at it, someplace in the 280 pages of images that I clicked through. But with that many images, I couldn't afford to spend much time studying each one, and I remember thinking "This beast is so distinctive, there ought to be at least one full row of images". Wrong again.